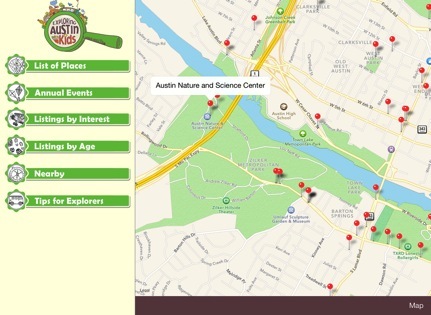 Exploring Austin with Kids News - The App Is Out! Not only is it the lightest way to carry the book around with you, but you can call ahead, check hours, or pull up the websites of the places you're headed at the touch of a button! Search for Places and Annual Events alphabetically, or by children’s interests, or ages. The mapping feature pins all the nearby places from the guide too. Typically, I'm not one to embrace technology (hence, the good old-fashioned guidebook). But the app is so simple and handy that even I'm using it! It has been keeping me from getting lost (although that is one of my tricks to finding magical, hidden gems), and with the fancy "search nearby" feature, I'm uncovering parks, swimming pools, and libraries just blocks off from our normal routes through town. The app contains the guidebook's full contents and will be updated regularly to keep up with ever-changing Austin. Check it out!